This is a continuation of an article on Arches. It has been preceded by pages on the Catenary Arch and the Roman Arch. Lets go back to our chain trick to examine the pointed Gothic arch. 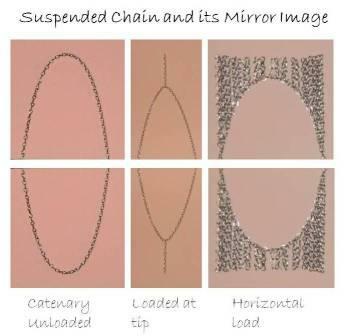 What happens if you put a length of chain at the apex, but none on the rest of the curved chain? Here you would be mimicking an arch supporting weight at its tip but elsewhere only supporting its own weight. In this case the chain forms a type of pointed arch. As with the Roman arch, the Gothic pointed arch has straight sides, so the chain arch only approximates the Gothic. 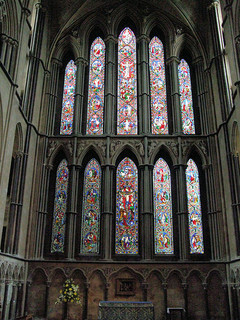 The pointed Gothic arch is ideal if the arch is supporting a lot of weight at its tip, and this is how they used pointed arches in Gothic cathedrals. With a Roman Arch you need the fill in between the arches to spread the load across the surface of the arch. With the Gothic you can eliminate this or make the fill so thin and light that it doesn't weigh very much. All the load gets carried from the tip, through the arch, to the columns. In this way the weight of a wall or ceiling or dome could be transferred to the ground. Since the spaces in between the arches were not carrying weight they could be filled with stained glass. So far as we know the medieval masons did not have this chain technique available to them. They had other trick available to them, some of which have been lost. Perhaps because of this not all medieval arches are perfect for the load being carried. There are all kinds of arches used in cathedrals. They aren't all the perfect shape. How did this come about? The arch is made of masonry, stone or brick. These have some thickness to them. They also have some lateral support coming from the walls. If there is enough wall beside the arch there is some room for error. The imperfect arch will not buckle because of the lateral support. After the mathematics of arches were discovered some researchers went back to study these old arches. They discovered that if you superimposed an ideal arch on the actual arch the ideal arch would fit within the thickness of the medieval arches, at least for the critical arches that did not have a lot of wall buttressing them. That ideal line might come close to the inner line or the outer line of the arch, but it would not cross it. This is not surprising when you consider that these arches had stood for hundreds of years. The arches that did fail did so while the cathedrals were being built. A question now arises. There are plenty of brick buildings being made today. Why do so few use arches? They can get by with this because, as Louis Kahn pointed out, builders can make a nice lentil out of reinforced concrete, which does very will in tension. They no longer listen to the bricks. They make brick building with flat lentils covering every window and doorway. This is so common that the number of bricklayers who know how to build a proper arch is diminishing. Today we even have the phenomenon of the fake arch. I will occasionally take a look at a Roman or Gothic arch and then have to take a second look. What appears to be a load-bearing arch is in fact an arch just for show. It is not made to support weight, but only to give the appearance. I don’t really mind this. At least they are paying homage to the arch. There has always been a little bit of the theater in architecture, doing things for appearances while hiding the reality. My concern is that our architectural heritage is being wasted. We have a generation of builders which are afraid of using materials in the manner most appropriate to those materials. The bricks cry out “I like an arch”but no one hears them. I don’t know what can be done about this. Arches do cost more than the alternatives arising from modern materials. Perhaps our hope lies overseas, in places where labor is still cheaper than materials. Some years ago I came across this delightful site for a training institute in Indiafocusing on earthen architecture. This may not directly benefit the U.S. housing industry anytime soon, but its comforting that the skills of the ancient masons will not be lost.